It wasn’t on purpose, but it was definitely providential that I read these two books back to back: “Surprised by Hope” by NT Wright, followed by “Bringing Heaven to Earth” by Josh Ross and Jonathan Storment. Wright is a leading NT scholar and retired Bishop, while Ross and Storment are on-the-ground pastors articulating their theology from the trenches of ministry. But while all three have different contexts, there is a clear and common thread that ties together these books: We are not meant to think of heaven as some abstract, in-the-future, far away reality. Heaven is meant to crash into our collective reality, right now. Part of their motivation for writing the book is a declining sense of impact coming from the witness of the North American Church. “Christians are the best reason for someone to follow or not follow Jesus,” they point out, and right now “it seems like the evidence for the latter is stacking up.” I think that any observant Christian would have to acknowledge this reality, and I appreciate the evangelistic mindset that permeates the pages of this book. Ross and Storment clearly care about the Gospel, the Kingdom, and the Church’s role in being a holistic and effective witness to the Resurrected Christ, and that commitment comes across warmly and consistently throughout the book. So how does our generation turn the tide? How do Christians become the best reason for people to follow Jesus? 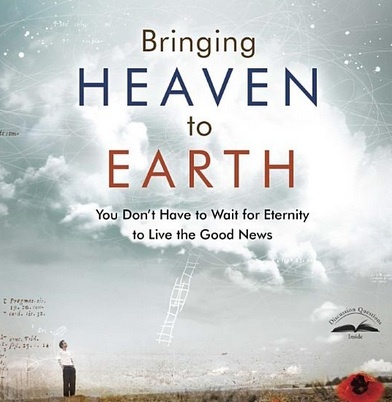 The book is then filled with a nice mixture of everyday stories of “heaven-earth collisions,” as well as some deep reflection on theological principles that undergird our understanding of heaven (I personally loved the exposition they did on the book of Ephesians, as well as the exploration of the difference of viewing the Bible through a “rapture” vs. “resurrection” lens). The authors mention early on that their contexts are quite different – Storment in an educated, college town, and Ross in an intentionally multiethnic and economically diverse community. I appreciated this diversity of perspective, and believe it will help readers translate these principles into their own context. I myself am in a historically poor neighborhood in Chicago (though one that’s experiencing a lot of changes due to gentrification), and resonated with much of what they shared. Like the authors, I see the need for a more holistic, integrated way of thinking about and practicing the presence of God. We live in a day and age where the wholeness of the Gospel seems to consistently evade us. We have trouble holding onto to the integrated nature of both internal & external transformation; evangelism & justice; faith & works; present & future reality. This in turn has led to a fragmentation of the Christian witness, and a more whole view of Jesus seems to be the only way home. Ross and Storment remind us that when Jesus told his disciples that we should pray “thy kingdom come, thy will be done, on earth as it is in heaven,” he was speaking to one of the most central motifs of the Bible. The point of Jesus’ prayer was not to focus exclusively on the afterlife, where we would join Jesus in heaven. Instead, we are to see heaven and earth as interlocking realities, made for each other. Their book is a welcome addition to a reclaiming of this holistic way of seeing the words and ministry of Jesus.